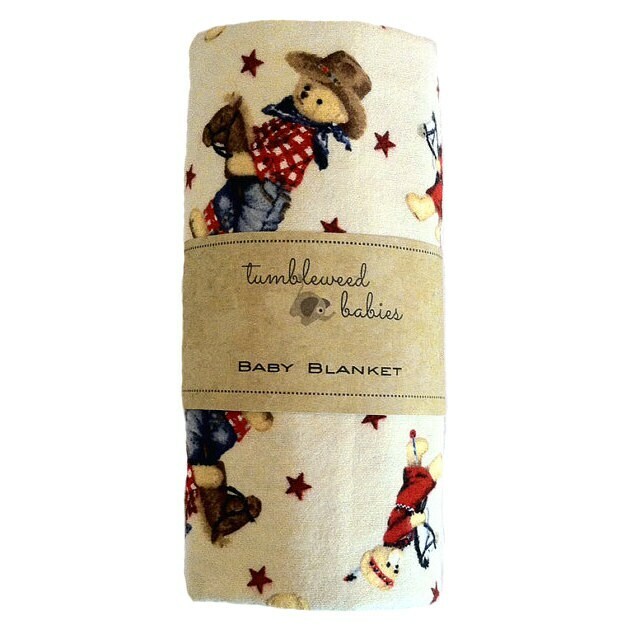 Welcome the new baby into the world with this beautiful "Teddy Bear Cowboy" blanket. Single layer cotton flannel fabric is wonderfully soft - keeps baby comfortable year-round! Available in large 36" x 42" Receiving Blanket size (also ideal for a nursing cover). Our cotton Flannel baby blankets are very popular and are unique gifts new moms will love to receive. Makes a great baby shower gift! Adorable! Very soft...well made...and use it every day! Soft adorable baby blanket. It will be perfect for my grandsons vintage cowboy nursery. Love it! Fast delivery! Thank you!